Text Accelerator - convert, transform, insert text with hotkeys. Pay with Bitcoin and get 30% off! True Launch Bar, has been selected as a "Must Have Application" on Tucows. It's also received the Tucows "Editor's Choice Award" for excellence. Detailed review of True Launch Bar on jkOnTheRun. 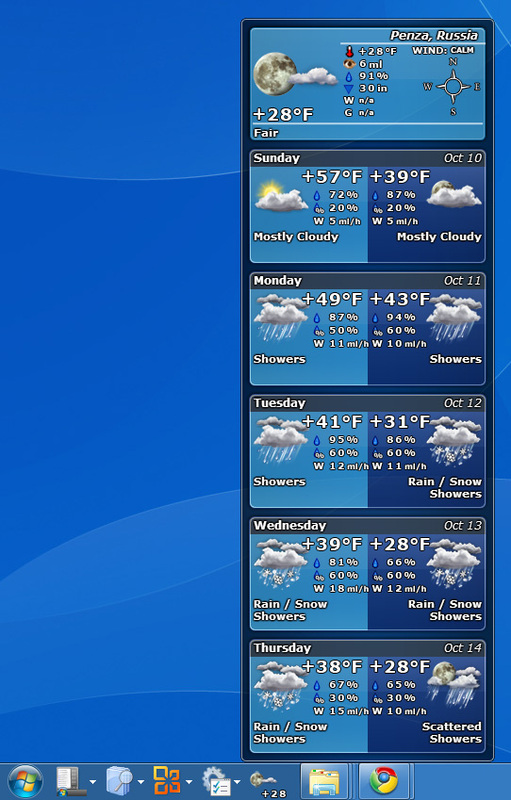 Using True Launch Bar on Tablet PCs and ultra-portable devices with small displays. 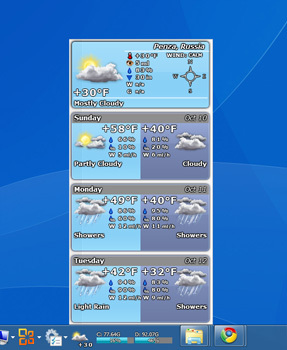 Weather Forecast v6.7 plugin is released for True Launch Bar. 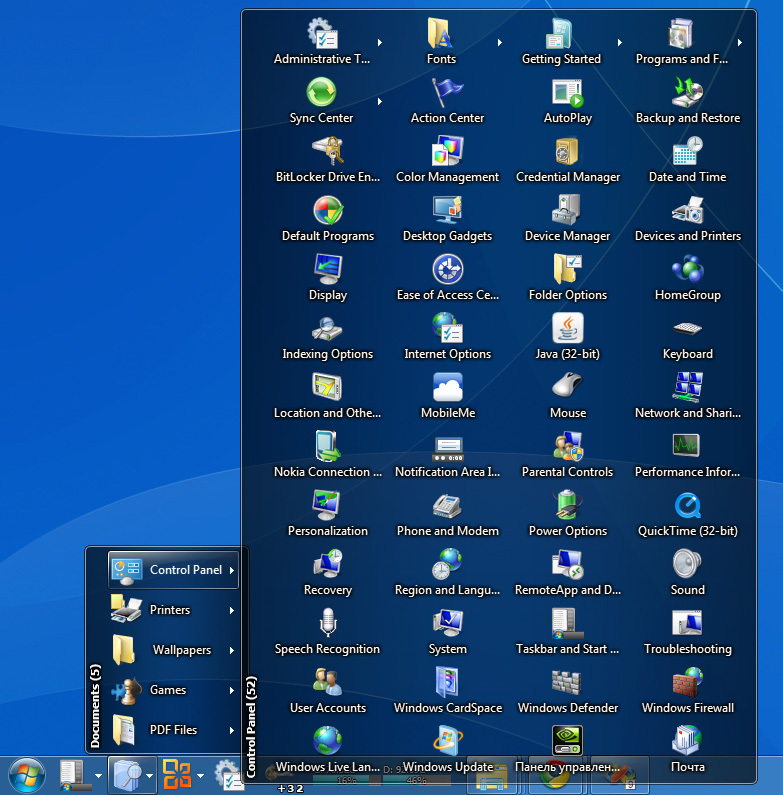 Looking at the motley crowd of shortcuts on your computer desktop but not able to find the one you need? Do you often find yourself looking for an app to run rather than doing your work? True Launch Bar can make your day go easier as it can solve these and many other problems related to quick access to your PC content! 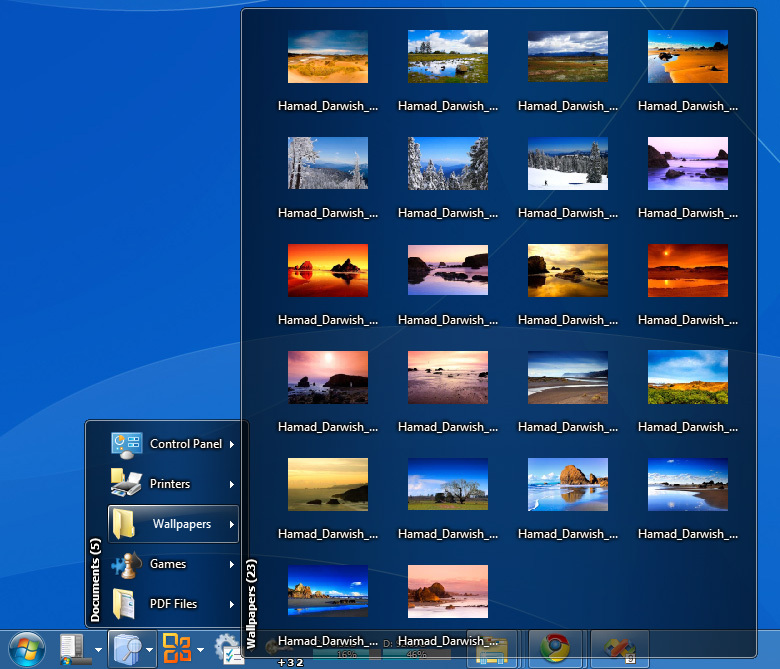 It’s the same Windows desktop you know and love. But with True Launch Bar, your workspace becomes more convenient and fun to use. 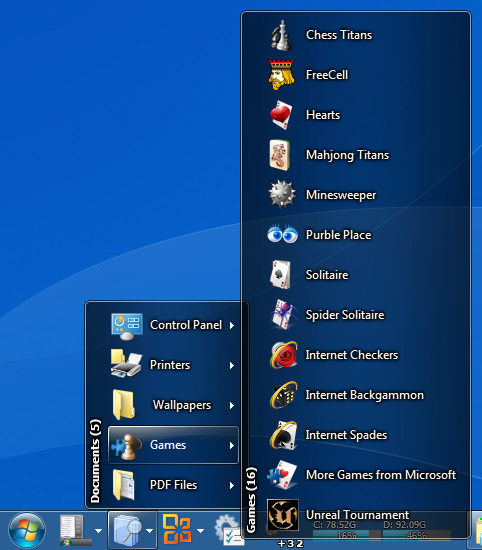 Create a custom menu on the taskbar to list similar apps. Drag and drop necessary shortcuts there. Select menu icons to find applications quickly. 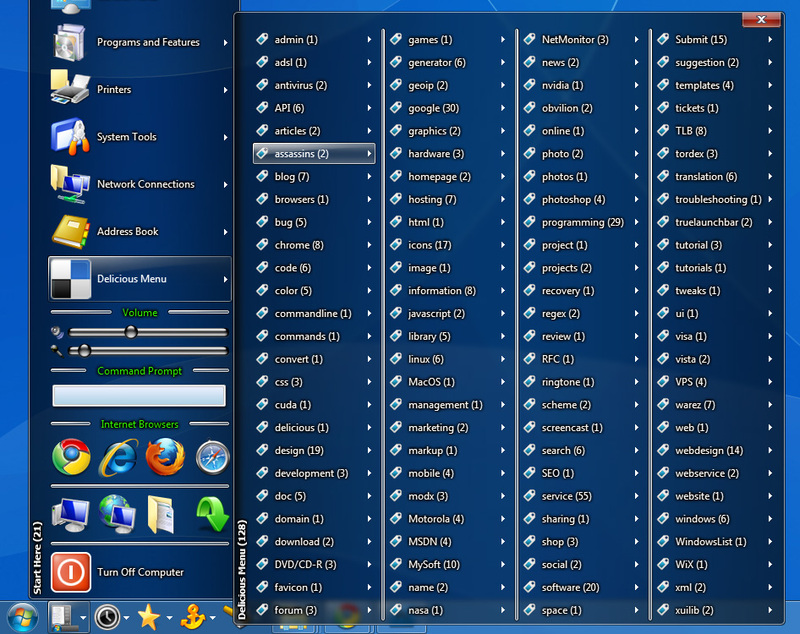 If icons are not enough, True Launch Bar can show tooltips for you to find what you are looking for almost on autopilot. With separators and submenus, you can group items by topic and create any kind of a custom menu you want. Are you a fully-fledged touch typist? Awesome! 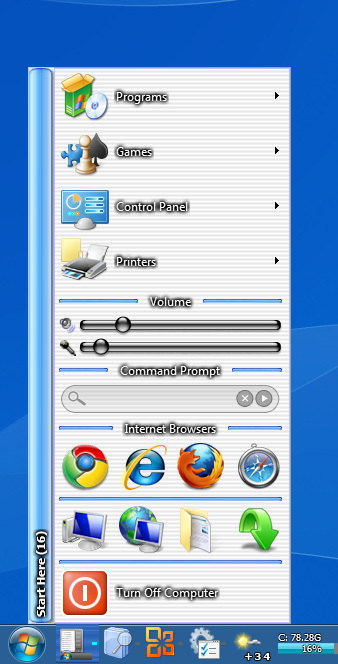 True Launch Bar lets you specify hot keys for menus and shortcuts to open them with a touch of a button. With True Launch Bar, any application is just a click away! 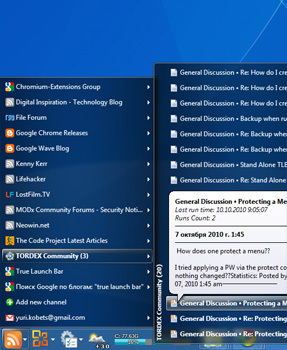 With True Launch Bar, reaching for computer folders just became the easiest part of customizing your computer desktop to your needs. 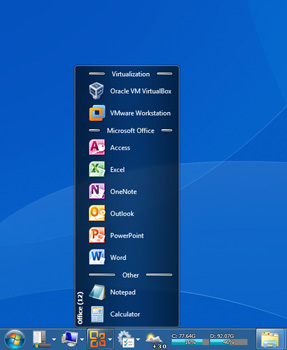 Create a custom menu from a folder using the program and everything you want will come to life with a mouse click. 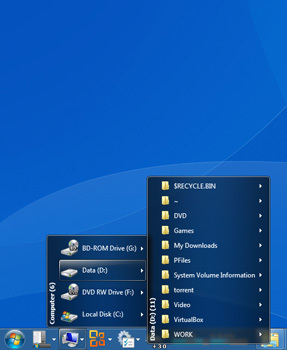 My Documents, Control Panel, Games and everything in between: you’ll be able to create menus for all folders! 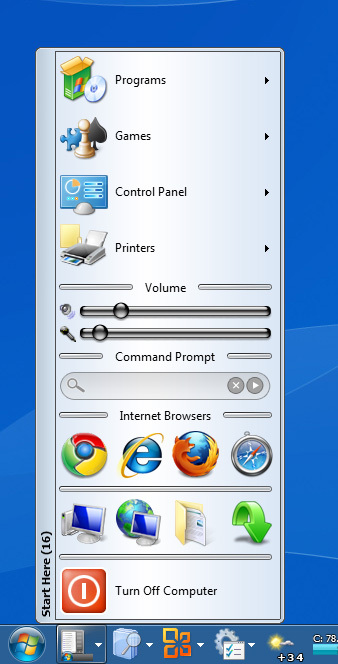 For example, you can create a menu with printers and manage them from the context menu. True Launch Bar can show thumbnails of your photos in a menu or display the list of recent documents. Filters can help you focus only on the files you need in a menu. 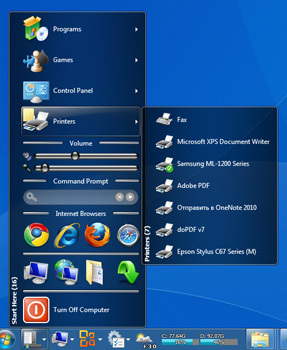 With custom menus available from the taskbar, you get what you want instantly, without having to browse through folders over and over again. Isn’t it nice? 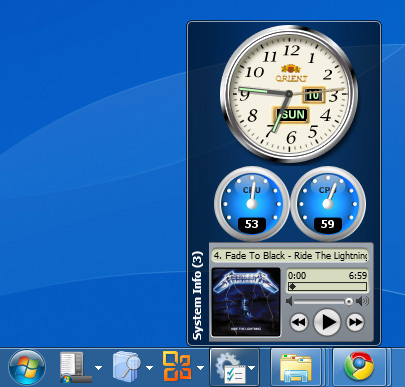 Part of the fun in customizing your desktop with True Launch Bar is adding a personal touch with plug-ins. Rather than using default shortcuts, you can now add buttons that work like small applets! 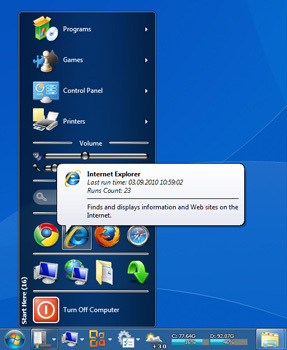 Imagine being able to check incoming mail, see weather forecast, track the latest news, manage contacts in a small address book, change music volume, control system parameters, and more – all using the button applets on the taskbar. 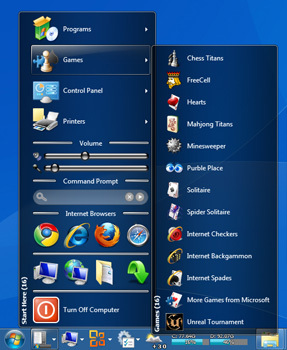 With our library of plug-ins for True Launch Bar, you can choose from dozens of taskbar applets that let you do all that and more! Apart from functionality, our applets can brighten your desktop and add a personal charm to your workspace. You can use default skins but if you like beautiful things, why not have some fun? Whether you want stylish, artistic, cute or fun, True Launch Bar has a skin for you. If you’re the creative type and want to have more freedom in personalizing your desktop, why not create a skin of your own? 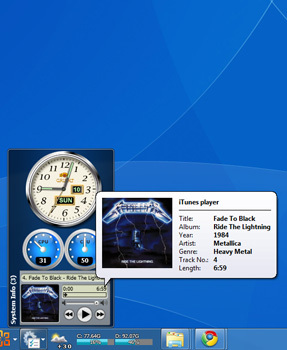 The format of a skin in True Launch Bar is fairly simple, so designing your own skin is not a problem at all! Minimalists can simply change colors for elements. 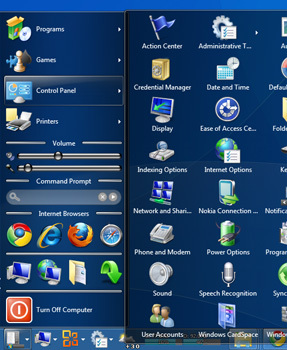 Those who have Windows Vista or Windows 7 can make use of all the advantages of the Aero interface – translucent, glass menus look totally outstanding! 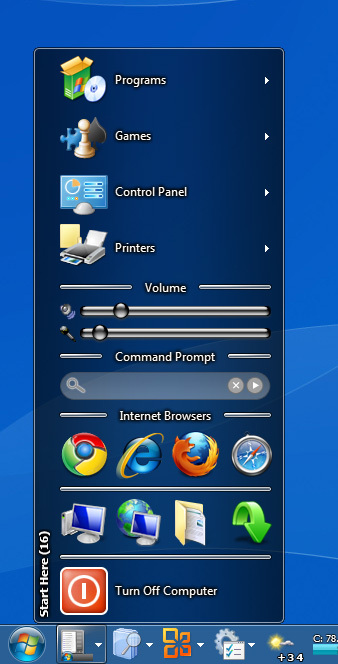 But even without skins, True Launch Bar looks clean and nice, exactly as other system panels or menus. 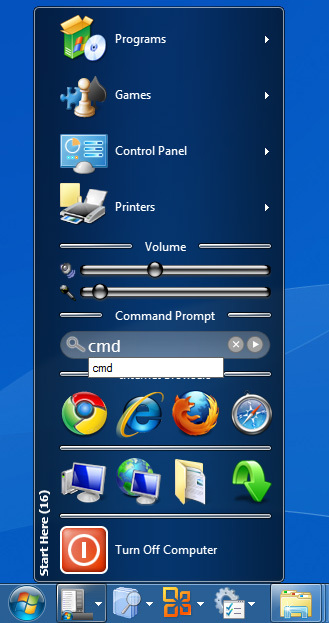 The program fully supports default Windows visual styles. 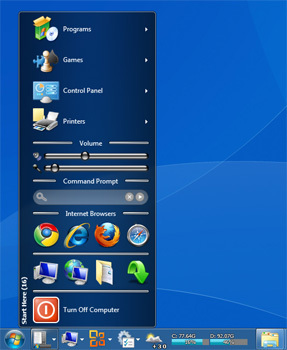 You can enjoy all the advantages of True Launch Bar not only on the taskbar, but also as a side panel. The side panel can be snapped to any edge of the screen on any monitor. 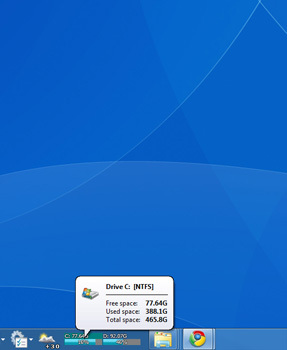 We have created a special standalone version of True Launch Bar that can work independently from Windows Explorer. You can use True Launch Bar as a side bar. 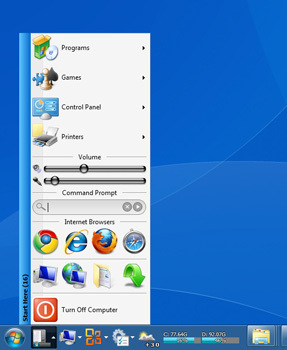 In Standalone True Launch Bar, you’ll discover an extended auto-hide feature control. 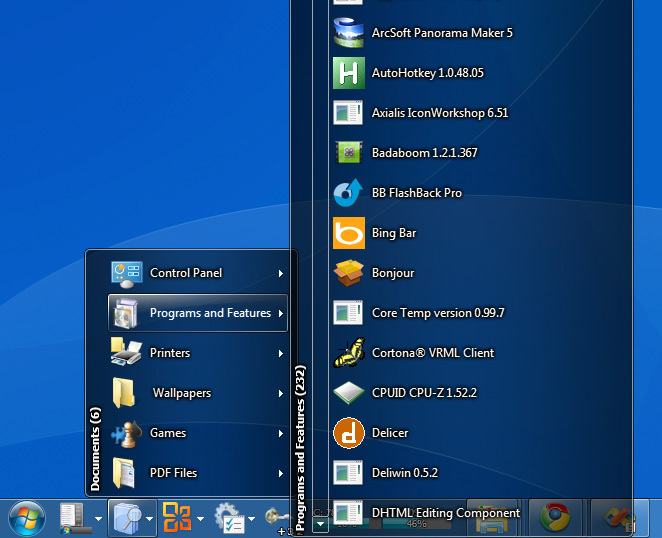 Moreover, for Windows 7 the standalone version is the only way to create an external bar beyond the taskbar. 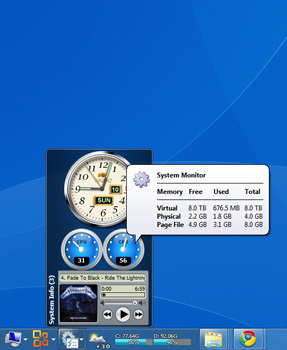 True Launch Bar uses the same technology as standard Quick Launch. This means that True Launch Bar does not have executable file. 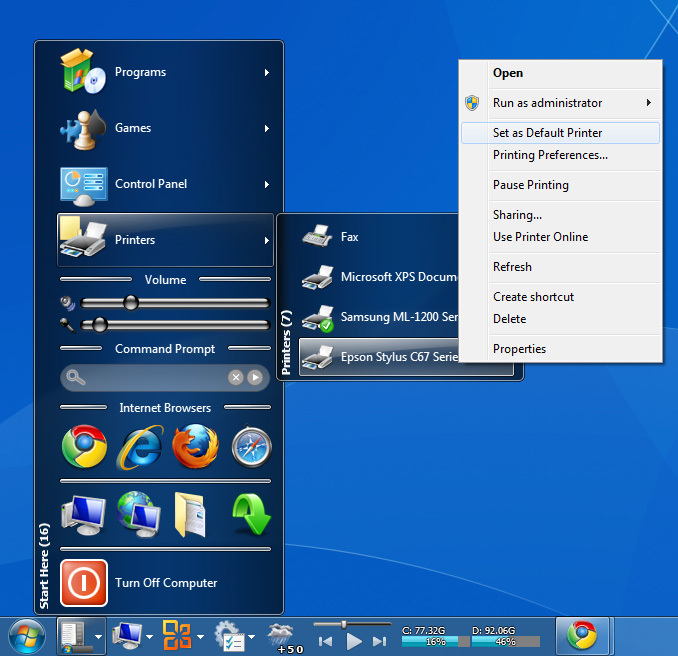 To open True Launch Bar right-click on the empty space of the taskbar, point to the Toolbars and select True Launch Bar menu item. 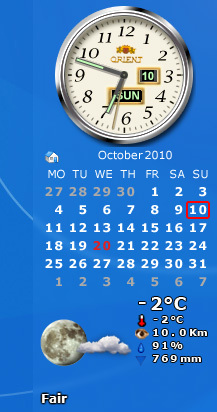 True Launch Bar also shows the title "True Launch Bar" of toolbar. 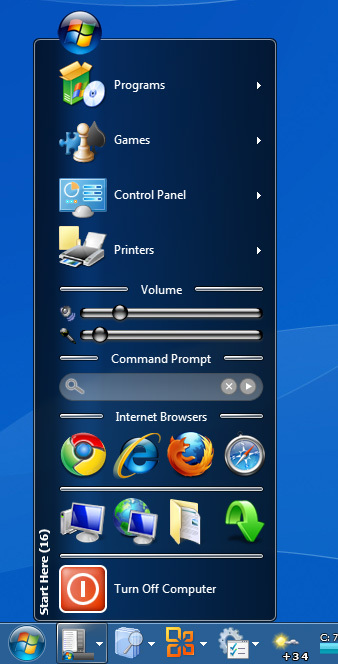 This is standard feature of the desktop toolbars. If you do not like it, right click the title and select the "Show Title" menu item. 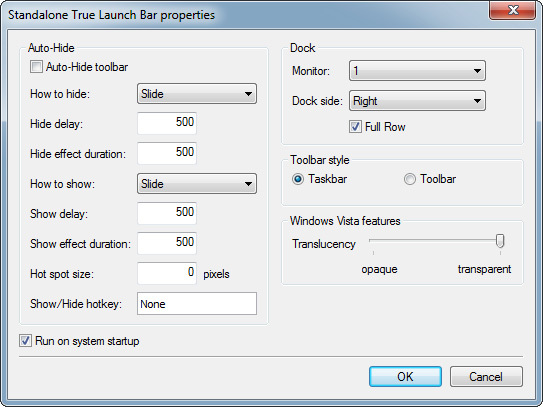 Initially True Launch Bar contains all button like Quick Launch. To add new buttons you can simply drag them to True Launch bar. 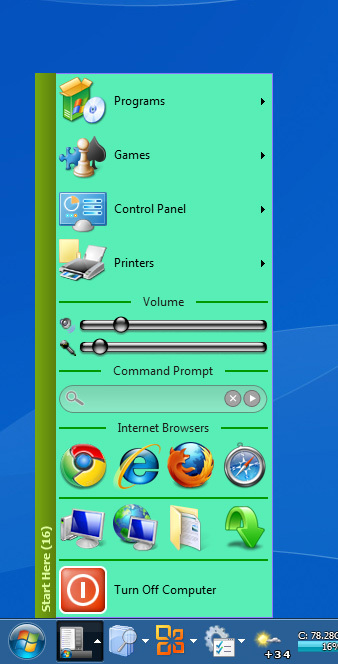 To create menu right-click on True Launch bar point New and select Menu. 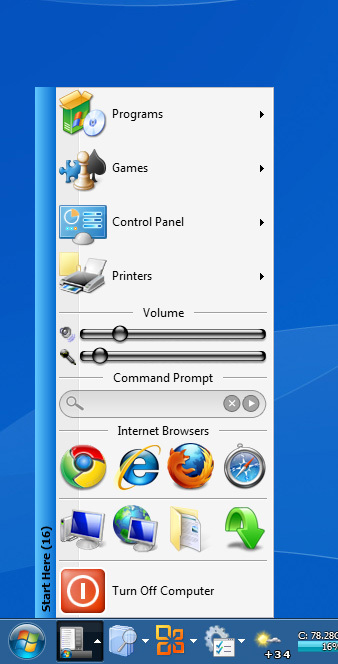 In the right-click menu you can find other options for True Launch bar and access to the Settings dialog.